"Chuck Hustmyre is the Keith Richards of books." DISTURBING THE PEACE promotional trailer (click the image below). August 2018, production has wrapped on DISTURBING THE PEACE and the movie is in post-production. I can't wait to see it. 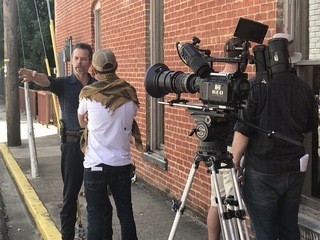 July 19, 2018 - THE CAMERAS ARE ROLLING for my new action movie DISTURBING THE PEACE, starring Guy Pearce. I'll be on set next week. I can't wait to meet the cast and crew. PHOTOS from the set of DISTURBING THE PEACE, starring GUY PEARCE. The Hero and the Bad Guys from DISTURBING THE PEACE. May 2018, Euramco Pictures renewed its option on BULLET TRAIN. They have a well-known director attached and are planning to begin production in February 2019. Chuck's screenwriting blog: "Throwing Hand Grenades"